The only good thing about this is the internet shines light on the hatred. It exposes right wing extremists and makes them defend their hatred, in the open, to a more accepting public. It's still very sad to see these children indoctrinated into hate and homophobia. Wow, we don’t know what to say about this. 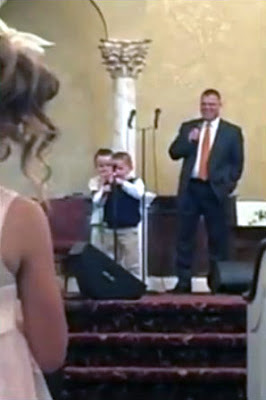 It’s a video of a young boy in what looks to be a church setting singing. "I know the bible’s right somebody’s wrong,” he says. And then the child goes on to say, "ain’t no homos gonna make it to heaven". The congregation jumps up to cheer. What say you? We want to hear your comments below. Self-righteous people? Or was this kid singing the truth? Thanks! And please, any who feels the need to contact them... No hate or threats of violence! Just make your point with calmness and clarity.